So how about this: you drag and drop a file onto an NAV page, and the file is automatically uploaded and stored in a BLOB field in the NAV database? And yes, it does the same no matter if you call it from the Windows or the Web client. And yes of course, no external components or dependencies needed. If you want to know how this thing works and why, read on. Otherwise, just download the thingy, install it (the instructions are included with the file) and abuse it to your fancy. Okay, I see you decided to stay. Good. This function receives the image represented as data URI. If there is data, the image is bound as the source of the #drop-img element. If there is no data, image is hidden, and text is shown. This function is called from the DataRead event trigger, and it receives the text representing the image as data URI. It first checks whether the data URI is correct through a regular expression. If it is, then it takes the part of the match that represents pure image data in Base64, converts it to binary, loads it into a stream, and then copies that stream into the BLOB. Here, the image data is stored into NAV. This function loads the image data into the stream, then loads the stream into an Image object to check its format, which is necessary for the data URI that it must return. 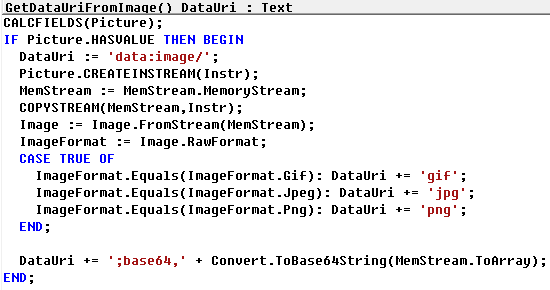 It starts constructing the data URI by specifying which image format it is, and then finalizes it by converting the memory stream into the Base64 encoded string. And that’s all. Simple, and functional. Now, if you haven’t downloaded the demo, don’t waste any more time, just grab your copy and put it to work. If you find it useful, please come back to tap my shoulder and to share with the world how happy you and your customer are with this component and with how much time it saved in your implementation. Cheers! Again, great presentation yesterday and i’ll make good use of your examples! Go Vjeko Go!! Thanks for the examples and the clear instruction! Thanks for another great session, Vjeko! Actually, once you have it in the stream, no need to load it into an image. Just create a file, then call the CREATEOUTSTREAM on the file. Also, change the regex to catch aby binary fike, not just images. But still have an issue with large images. When dropping larger images (in the webclient) , the following error occured: "Communication with the server failed, and the content cannot be displayed. Refresh the page or open a new browser window." Monitoring with firefox + firebug results in the following http error 413: request entity to large. Great catch! About the solution ideas, I have two, one of which I am not quite sure about. One is to try to play with the amount of data the NST can receive. The other is to send data to NAV in smaller chunks. If I get time, I’ll provide both, but cannot promise when it will be. Is it possible for u to provide this solution also for Nav 2013/Visual Studio 2010 ? Yes, it is possible. I’ll do that at my earliest. Hi Vjeko, this seems a very good solution! We’d like to use it, was a version for NAV2013 published in the end? Hi Daniele, thanks for the comment! I am currently working on a new version which will work on all (2013, 2013R2, 2015) versions, will support multiple-file drop, and will fix the issue with >40KB upload through web client. I’ll publish it on my blog very likely this week, next at latest. Is that okay? Thanks for fast feedback, looking forward to it! Hi, are you still planning on upgrading the extensions? Hi, are still planning to update the extension? Hi thanks for the the solution ! Works really cool. Hi Povl, is it possible if you could share your script? thanks. Could you please share your modified solution, if possible? The code is attached to this post. Can you not find it? I was looking for Povl’s modified version, cannot seem to find it? we also have the file size problem, so we can’t upload files >48 KB. I tried to send the BASE64 String step by step in “smaller” packages and merge them in NAV. But this also occurrs the 413 Too Large error. The NAV / Web Client configuration file we also modified. We changed the chunk size, but this has no effect. Also, we tried some configuration modifications on IIS but we get everytime the 413 error if we upload files >48 KB. The issue with the error message 413 is, that the number of Bytes exceeds an internal buffer. You may split the data into smaller chunks (and also use File.Slice() API to support very large data files). The Dynamics NAV Control Add-in API does not expose information about when an InvokeExtensibilityMethod() call is complete and the Dynamics NAV Server is done executing the Trigger. This is needed to synchronize the code in the control add-in. Hi Vjeko, thanks for all the very useful demonstrations and How-To videos online! I’m hoping you might be able to shed some light on a problem I’m having trying to display a c# winform control add-in in the web client. I have a calendar control add-in created in C# that runs ok in windows client but not in web client, this was understandable as there was no manifest file and interface C# program containing triggers/methods. So I created a manifest file that invokes a C# interface program method which then embeds the original C# calendar program packaged as an activeX into the web client as a HTML object(similar to your how-to video on WMP). This method works ok for a simple HelloWorld() method but not for a winform createcontrol() method. Do you know is it possible to achieve what I’m trying to do i.e. embed a c# winform into the web client? Based on Carsten’s suggestion, i managed to get a file-upload working with files much larger than the 48 Kb limit. 5. It keeps repeating this process until all blocks for all files are received. Key thing here is that the Control Add-in should Always be in control of sending the blockdata. At first I tried to try a kind of ‘pull’ scenario so NAV pulls the data from the Add-in, but this Always failed. I don’t know the reason for this, but i’m guessing it has to do with the fact that NAV is in fact unaware of the Web Client (since there’s no active connection) and therefore fires multiple events at once to the control add-in in parallel. When the Control Add-in is in charge of firing the events and sending the data, NAV only has to listen and comply to the request. Hope this helps for anyone still fighting the issue. I have the same issue on my Addin, on a normal NAV Client all works fine, when using the same addin in Webclient I get the communication error … Could I get your solution to help me out ? Hi Vjeko, thanks for this post. I tried to use your control and I get this error message “An error has occured in the script on this page”…. do you want to continue running scripts on this page. Any suggestions? User has full permission on client and server. I’m using version IE8. Could it be IE version? Could be IE version, I am not quite sure. I haven’t tested it on IE8. Can you try it with a higher version? Thanks Vjeko, will try to upgrade IE version. HTTP 413 has been resolved with CU 10 for Microsoft Dynamics NAV 2015. 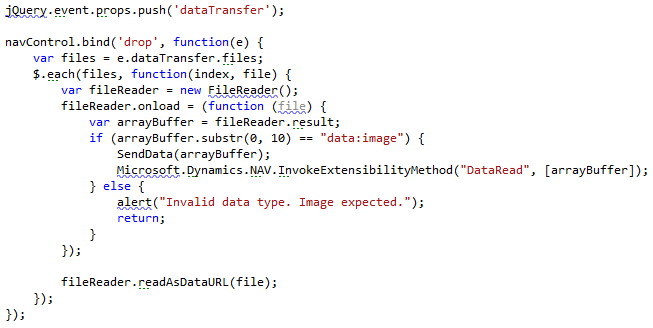 NAV Development Team bounded the WCF MaxReceivedMessageSize to system.web/httpRuntime maxRequestLength. A zillion thanks to Vjeko to drive the NAV development world into the sky. And higher. Hi all, I’m finding the possibility of drag and drop very interesting and I got Vjeko’s solution to work, thanks for that. But I’m quite interested in povl’s adjustment to be able to drag and drop any file. Is that adjustment posted somewhere as well? 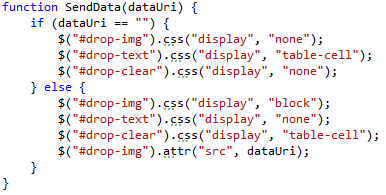 How much change this code to Drag and Drop any type of file not only Images? I would like to store to a Record a Drag and Drop file. Anyone can have article for it? Very nice article! If saving to disk, is there any way to extract the original filename? Congratulations Vjeko, for this excellent article! What if you just to drop a web link to a file (e.g. from O365 Sharepoint) and record the link in NAV, instead of the full physical file? Would it be possible with a tweak of your demo code? Thanks! I am pretty sure it would work. Some googling + stackoverflowing would surely tell you how. It sure would be possible. Hi Vjeko! tried to create use page 59901 in my NAV 2017 “Items List” page as a factbox, and got in the RTC “The metadata object 59901 was not found.”. Then tried to compile the 59901 Item Picture Factbox object and got an error for the “CREATEOUTSTREAM” unknown variable… And with my restricted NAV license, can’t even open it in design mode… Any ideas? 1	Page	59901	Item Picture FactBox	Error	SavePicture	5	You have specified an unknown variable. CREATEOUTSTREAM Define the variable under ‘Global C/AL symbols’. thanks for your wonderful function….I have loaded into NAV2016 but does not seem to work. We would be interested in contracting with you to load and adjust this function a little for our NAV2016 application. any idea of how to implement this to Business Central? Need some help on files drag and drop. This is something that people often ask, but there is no difference in dragging and dropping images or any kind of files. Images are binary files, and this shows you that you can handle any kind of file out of the box. If what you are trying to do is show a preview of any kind of file (PDF, Word, Excel, PowerPoint) then this is a completely different topic, and it will require you to use a library which can do the preview for you. Hey, I know this was done a while ago… not sure if I’ll see a reply…. but I was wondering if it would be easy to adapt this to the new ControlAddin object brought into use in the new AL development environment for recent versions of NAV/Business Central? Yes, of course it can be done, however I never make any promises here on my blog. If I get to do it, I’ll do it, if I don’t, then I don’t. Keep in my that this blog is my personal time and personal effort and is for free, and what you see is what you get.